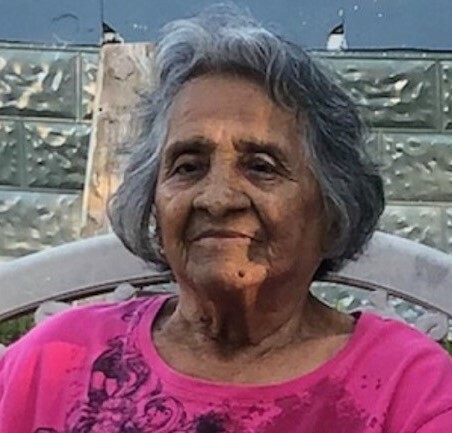 Isabel Cavazos Trejo, 91, of Greenville went to be with her Lord and Savior Thursday April 11, 2019 in Greenville. Funeral services celebrating Isabel’s life will be held at 3:00 P.M. Monday, April 15, 2019 at Ingram Funeral Home in Quinlan with Father Victor Hernandez officiating. Visitation will be held from 1:00 P.M. until service time. Mrs.Trejo was born October 3, 1927 in Alba, Texas. She is the daughter of the late Pablo and Ramona Cavazos. She was raised and attended school in Alba. She was married Ramon Trejo in May 1972. She worked as a seamstress for Henson Kickernick for over 25 years. She was the garage sale “Queen”, loved sewing and yard sales. She loved gathering with her family members to play cards and she was an avid General Hospital fan. She was also preceded in death by her daughter Mary Irene, a brother, Jesus Cavazos, a sister, Margarita “Maggie” Bocanegra and also by a daughter-in-law, Linda Gail Escalante. She is loved and will be missed by her husband, Ramon; sons, Modesto Escalante and Johnny Escalante both of Greenville and Philip Escalante of Alamo, Texas; daughters, Patricia Escalante of Sulphur Springs and JoAnn Ruelas of Greenville. She is also survived by several grandchildren, great-grandchildren, great-great-grandchildren and great-great-great grandchildren and many other family members.